chicken babies: Christmas Project - Sing LOUD!!! 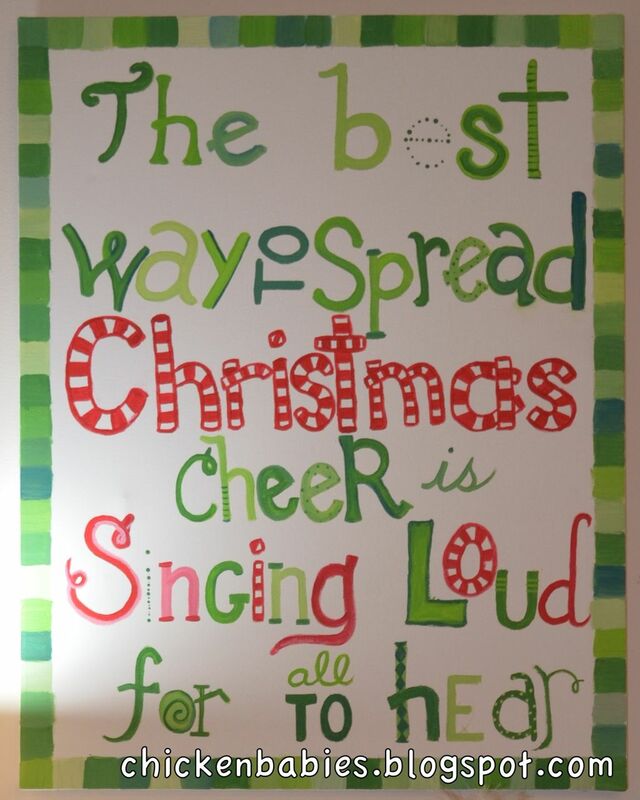 Christmas Project - Sing LOUD!!! The other day as my husband and I were going through some things left unorganized from the move, he pulled out from the pile a large blank canvas and asked "how many times have we moved this now?" Because you see, many, many years ago, while I was a senior at college and before I was married or even dating my husband, I took a beginner's oil painting class just for fun. While buying supplies, I had found this canvas on clearance for a great price and thought "Hey, I should paint something big someday." So it was a fair question. We have moved that canvas many many times and stuck it back in a storage spot many many times. But not this time! No, I was determined to put it to good use and justify the trouble of moving it across the country. It was a great deal after all. 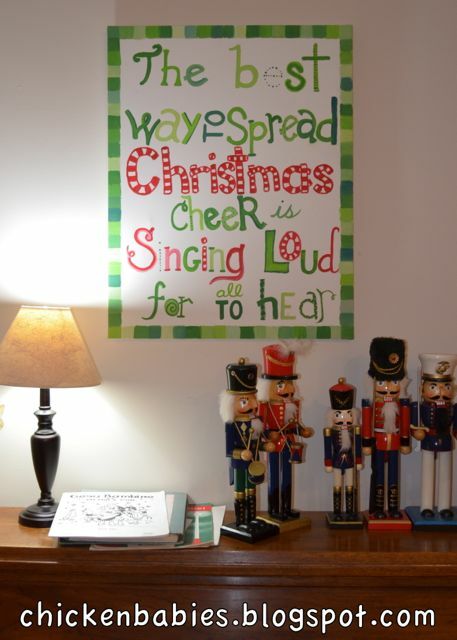 We love the movie Elf around here, and last Christmas when I had seen in an etsy shop a print of one of our favorite lines, I knew I had to have that quote hanging above my piano at Christmas time. I was surprised I had never thought of it before. I didn't want to pay money for a print and then have the trouble and cost of getting it framed though, so it didn't happen last year. Now I had the perfect thing to paint on my giant blank canvas. Obviously it's not perfect. For example, I am all too aware of the huge gap between the first and second lines, but unfortunately I can't fix it. Some might suggest that I should have sketched it out before I started painting so such a thing would not have happened. What an odd concept. Some of us prefer to wing it and live with the consequences. I've thought about adding some holly or something in that space but I'm afraid if I keep adding things it will just end up ruining it. Opinions? I guess I could redo it on a different canvas, but it'd be hard to beat the price of the first one. Very fun! The lettering is so great, I thought you'd printed it out on a Cricut and ModPodged it to the canvas. Great job. How about little elf foot prints straight across the canvas in the blank space? That might be cute. Or maybe little elf shoes? Hmmm. I'll give it some thought. Thanks Aunt Ginger! It's brilliant! Love it. Way cute. And I also love that at this very moment we both have Gesu Bambino on the top left of our pianos. Keep on keeping it merry and bright! Ha! I love that you recognized it. It's one of my favorites. :) Miss you guys. 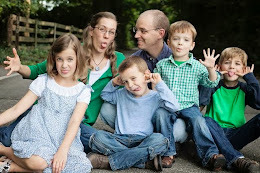 Love it Erin! So unique. In perfections just make it more hip. Keep it. It looks great! So cute! You did a great job. If the space really bothers you perhaps you could underline "The best" for emphasis. That is great! I like your nutcracker collection too- just started one last year! It's great the way it is. If you try to change it, you'll only mess it up. Trust me!